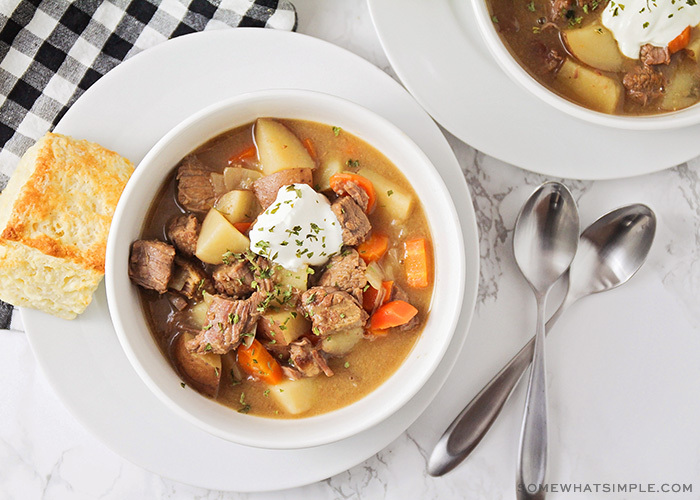 This crock pot beef stew is a savory recipe that is the perfect comfort-food meal. Made in a slow cooker all day until the beef is incredibly tender and hearty vegetables are bursting with flavor! 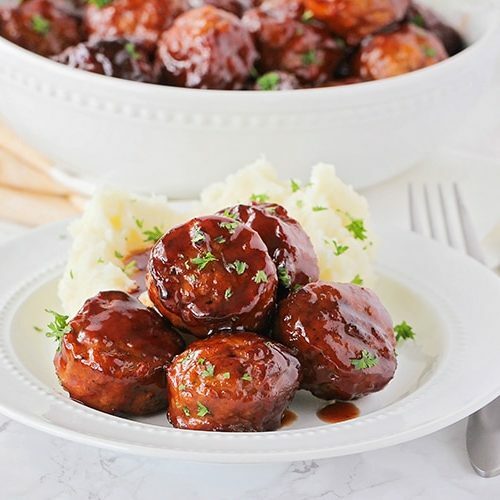 Crock pot meals are kind of our jam around here! Chicken Tacos, Sweet and Sour Meatballs, Baked Potatoes etc! 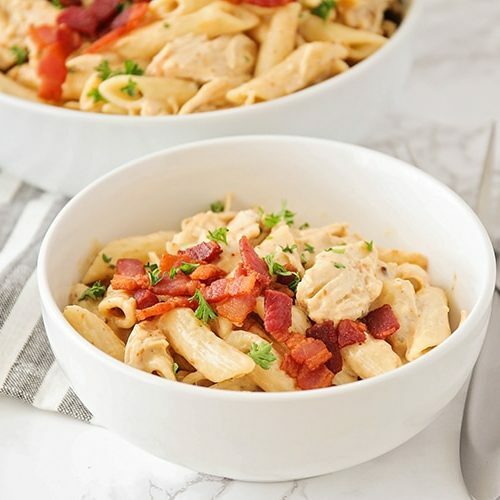 I love the convenience of tossing all the ingredients into the crock pot in the morning, knowing we’ll have a delicious dinner just waiting for us that evening! If you ask me pretty much any day of the year what I want for dinner, it’s a pretty good chance that my answer will be soup! I really can’t get enough soup, regardless of the weather outside. There’s something so wonderful about a warm bowl or soup or stew! I love the way the flavors mix and build on each other, and there are so many different and delicious combinations. 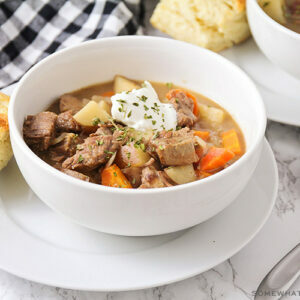 This savory and simple crock pot beef stew is one of my favorites, and I make it all year round. It’s kid-friendly, and totally delicious! 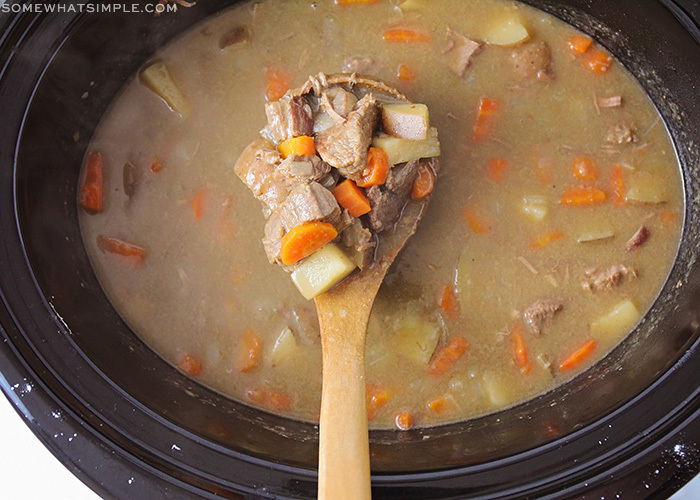 This crock pot beef stew is so easy to make! While not necessary, I like to brown the meat in a skillet before I put it in the crock pot, because it adds a lot of flavor to the stew. It’s definitely worth taking the time to do it, and it results in a much richer and deeper flavor. After you have finished browning the meat and placing it in the crock pot, add a cup of beef broth to the hot skillet. Give it a little stir in the pan to loosen up any small beef bits still left in the pan and then pour it all into the crock pot. You want to make sure you don’t leave any of the delicious meat flavor in the pan. If you’re in a hurry, you can cook it on high heat for 4 hours instead, but I prefer the texture of the stew when it’s cooked on low heat. Plus it smells so delicious while it’s cooking that I don’t like to hurry the process! I like to serve it with fresh bread or warm biscuits on the side, and a dollop of sour cream on top. 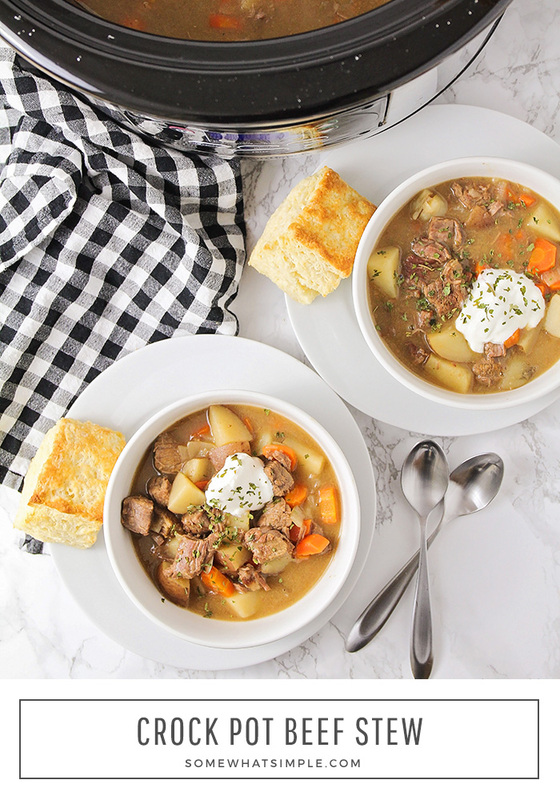 I was a little skeptical about the sour cream at first, but let me tell you – it takes the stew up a notch and makes it even more flavorful and amazing! It adds a little creaminess, and is a great counterpoint to the beef and vegetables. Yum! If you have any beef stew left over, wait until it has cooled and then place it into an airtight container and store it in the refrigerator. The stew will stay fresh in the fridge for about 5 days before you’ll need throw it out. My husband likes eating these leftovers for lunch at work, so I’ll put them into one of these larger deli containers so he can just grab one on his way to work the next day. If you have a lot left over and don’t think you’ll be able to finish it within a few days, you can freeze this recipe. Just be sure you’re storing the stew in a freezer-safe container if you choose to go this route. Because the prep is so easy and takes just a few minutes, I wouldn’t recommend making a batch ahead of time and freezing it. In my opinion, there’s just nothing like the taste of a fresh pot of beef stew! The finished stew is loaded with tender vegetables and flavorful chunks of beef, and is so rich and hearty you have to try it! 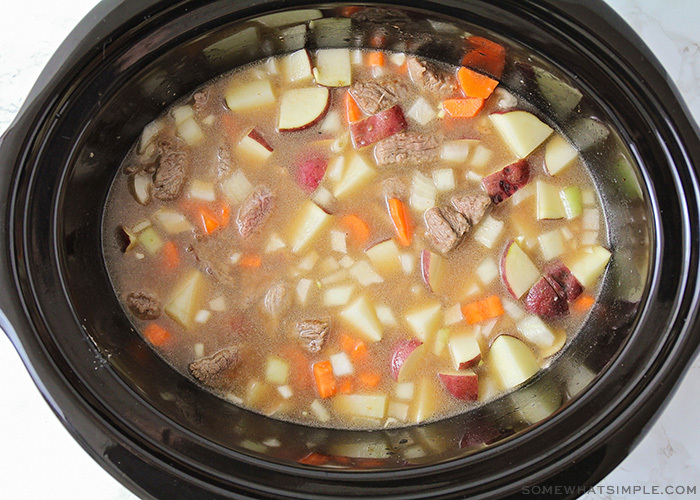 Let us know how much you love this crock pot beef stew by leaving us a comment below, or tagging us on social media! We love to see what you’re making in the kitchen!!! This savory beef stew is made in the crock pot, and cooks all day until it's tender and flavorful. It's a cozy comfort-food meal! Heat the oil in a large skillet over medium heat. Toss the beef with the flour, then add the flour to the skillet. Cook, stirring frequently, until the meat is mostly browned. Add the onion, garlic, and tomato paste, and cook for 5 minutes, or until the onions are tender. Pour the mixture into the crock pot. Add 1 cup of beef broth to the hot skillet, and stir to loosen the browned bits from the bottom of the pan. Pour the broth into the crock pot. Add the remaining broth to the crock pot, as well as the salt, pepper, carrots, and potatoes. Stir to combine. Cook for 6 hours on low heat. Serve hot with a dollop of sour cream on top and fresh crusty bread on the side. 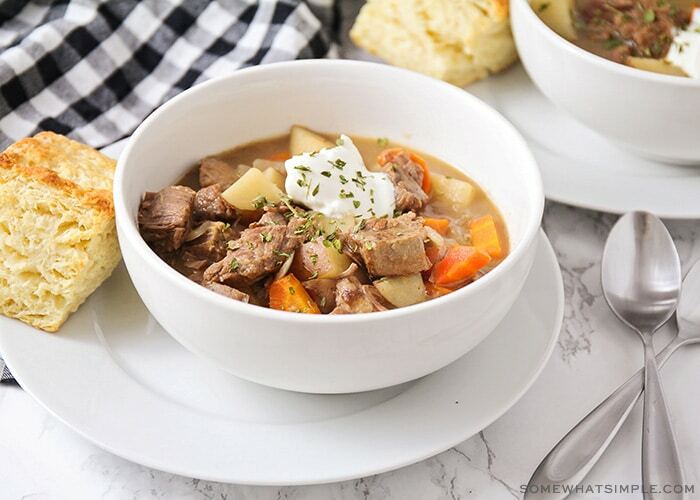 The crockpot makes this beef stew a winner. I love that I can start it in the morning and have supper ready in the evening. I couldn’t agree more and smelling the stew cook all day is the icing on the cake! What a great dinner on a cool spring evening! Sounds delicious! 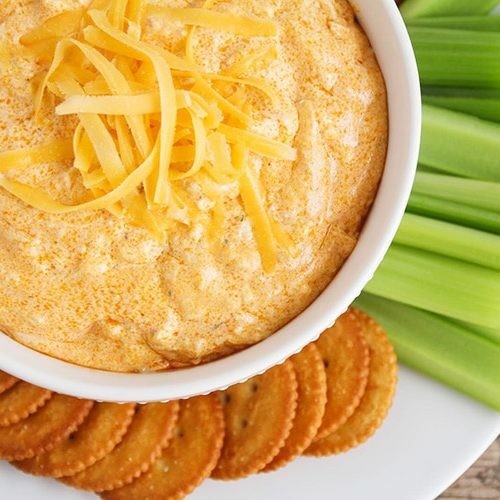 Such a delicious comfort meal! Thanks, it really is the best! Thanks Jessica, it really is super delicious! Oh myyyyy heavenly!!! Can’t wait to try this out in the crock pot!